The DUP has branded the Pat Finucane Centre report into the Protestant migration from the West Bank of the Foyle in the 1970s as ‘an attempt to rewrite history’. The report ‘Protestant Migration from the West Bank of Derry/Londonderry 1969-1980’ was published by the PFC on Friday. Authors Dr Ulf Hanssonfrom Sweden, and Dr Helen McLaughlin, who is from Londonderry, said it was important that the report was considered in its entirety and the temptation to cherry-pick parts which supported their point of view should be resisted. The academics found that intimidation of Protestants was the main but not the sole reason for the vast reductions in the number of Protestants living west of the Foyle. DUP’s East Londonderry MP Gregory Campbell and Foyle MLA Gary Middleton took exception to the findings, saying there was ‘obvious’ and ‘naked sectarianism’ a the time which resulted in people fleeing the west bank. Mr Campbell said: “The report headlines itself as “Protestant Migration from the West Bank”. ‘Migration’ is a term more commonly used to describe a natural phenomenon among some birds who migrate for the winter, who usually return when the weather improves. “The primary and overwhelming cause of the exodus from the West Bank was intimidation and violence. “They did not ‘migrate’ and 99% of them never returned. “Those who authored this report should listen to the voices of people directly affected and who have spoken of how the report seeks to “diminish” their experience. “They should not diminish it by increasing the significance of peripheral factors, by painting it as part of a much longer-term pattern or blaming unionism for 90% of the Protestant population leaving the West Bank in ten years. “Instead of attempting to rewrite history, we should ensure future generations do not forget the reality of what happened as it has been chronicled on film, in print and on stage. 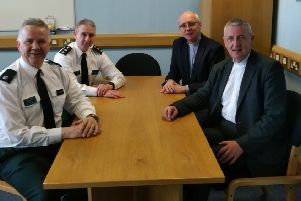 Mr Middleton said: “Over the years there have been attempts to justify, rewrite and portray the exodus of Protestants from the West Bank of Londonderry as being something much different from the reality at the time. “The factual, evidence-based position has been well documented by the thousands who were intimidated and attacked from their homes and who were left with no choice but to move out for the safety of themselves and their families.